Kittens are $1200. If you have chosen a kitten, a $600 deposit will hold the kitten. If no kittens are available at the time, a non refundable $100 deposit will hold your position to choose a kitten once they are born. ie. 1st deposit, 1st choice. If you decide not to get a kitten, your deposit less $100 is refundable. I can meet 1/2 way or if necessary I will drive the entire way. I ask .35 per mile to off set my gas, tolls and travel expenses, but if this puts an undue financial strain on anyone, we can certainly discuss it. For those customers who are too far to drive, I will either fly with your kitten to your airport or you may fly into Pittsburgh International Airport and I can meet you there with your kitten. 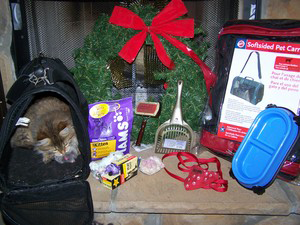 Most airlines have very reasonable carry on costs for your pet. 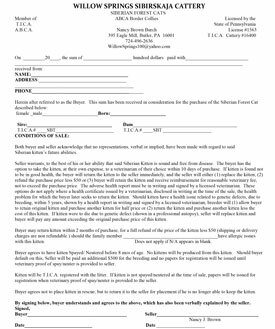 To purchase an available kitten or cat or to reserve a kitten or cat who is not ready to go home yet, fill out the registration form below. This allows me to get to know a little about you and it helps me to advise you towards the best kitten or cat for your home. Our cattery is tested FeLV and FIV negative. Our Adults are screened annually for HCM by a Board Certified Veterinary Cardiologist. We only give our kittens Heska UltraNasal vaccines, and if necessary, for leukemia & rabies vaccine, we use a recumbant vaccine, Merial PureVax Recombinant Leukemia vaccine and PureVax Feline Rabies, as there is no adjuvant (which can cause cancer in cats). Many people will say that the cancer does not occur at a very high rate. Unfortunately it killed one of my customers kitten, she was only 4 years old (that is more chance than I am willing to take). Kittens are wormed from 2wks. of age, every 3-4wks. until they go to their new home. Kittens receive their adult vaccines at 12wks and 1 day. Kittens may leave as soon as they are solid with their vaccine (usually 1wk.). If a kitten is not confident and ready at that age they will stay a little longer. Stress can make a kitten more susceptible to illness. Kittens are eating solid food by a young age. They gain emotional stability staying with mom until an older age. Studies have also shown kittens weaned and removed from their mother at an early age have more health issues and a shorter life span. Our kittens and cats are guaranteed to be healthy and free from disease and parasites when they leave our home. Our Siberian Cats and Kittens are to be INSIDE cats only. We have a NO DECLAW policy for all our cats and kittens. Declawing is extremely painful. It involves removing bones from their feet, and healing requires several weeks to months. In many cases a cats feet will remain sore for life. Cats need their claws for daily grooming and for proper exercise of muscles by stretching and scratching. Please register to request an available kitten or cat or to be placed on our waiting list for an up and coming litter by filling out the Kitten / Cat Request Form. Claws help a cat jump and retain their balance. Trimming a kitten’s claws is simple. We trim the babies’ claws on a regular basis and they soon learn to accept this procedure as routine. They have grown up with various scratching posts and climbing toys and have been taught to use them instead of our furniture. You will have to show them what you expect in your home. These cats are smart and want to please their owners. Our cattery is registered with TICA & CFA & TAIGA. Pet buyers will receive the TICA registration papers for their kittens when proof of spay or neuter has been provided. Our kittens and cats are sold with a written purchase contract (as shown below. NOTE: The non-refundable deposit is $100 (not $50). The price of a Siberian kitten is $1200.